In case you’ve not heard, there is a Green Revolution in progress. To quote a popular commercial, “The way we use energy now can’t be the way we use it in the future. It’s not conservation, or wind, or solar. It’s all of it.” I have long kept a solar-energy project in the back of my mind, so I ordered a 12v/.2A solar panel power supply from a vendor (note: I erred while filming and said it is a 2A panel. It is a .2A panel). As a first step project, I figured I would power up my Arduino, use my shiny new XBee modules, and relay some sort of meaningful data back from this wireless solar-powered microprocessor. How is the weather outside today? If I am getting data, its sunny! 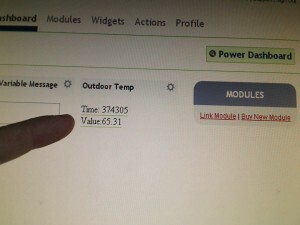 And 65 degrees on my deck according to my newly built solar temperature probe. I did some first-steps using 2 Arduinos communicating over the default broadcast configurations over a span of about 2 feet. 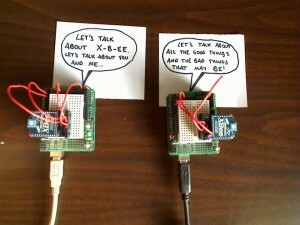 The Salt and Pepa of the Arduino world. 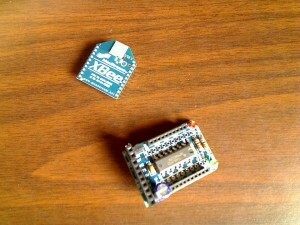 I settled down Arduino 2 after his diatribe likening himself to Pinnochio, and told him that I would take care of it. 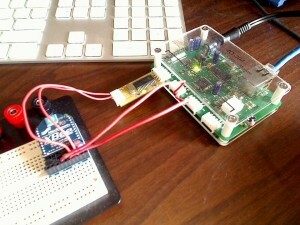 I ran out to Radio Shack and picked up the right barrel plug adapter, and added some wires to run into the Arduino. 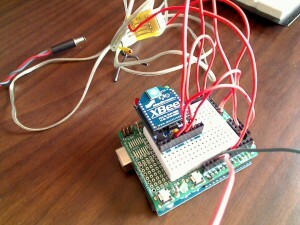 Note: the jumper must be set on the Arduino to take power from external. My Solar Panel provides 12v, and the Arduino can take power up to 12v. I used the temperature probe that I had from my ioBridge, crafted a quick sketch (see below) on the arduino (the analog scaling factor may be off since its not precisely linear, but c’est la vie) and waited for the sun. As soon as I plugged it in, the Arduino woke up, lights blinking, and was soon processing and wirelessly communicating! All this achieved because of energy provided by that flaming ball in the sky. Now that’s cool. A nice springlike 65 degrees outside at the moment. Good stuff… I am thinking of doing something similar for monitoring the temperature of my homebrew beer in the shed over the winter. Excellent idea, Jason. A Lager-Monitor. I will check into those draw numbers. It’s a very relevant question. I am flirting with making a small solar-powered autonomous vehicle, so all the draws and bursts will need to be worked out. Keep me in the loop on your solar projects and thanks for the comment. This is a useful article though… And you know, John Rogers, professor of science and materials engineering at the University of Illinois and his team have created a new method to produce flexible solar cells, transparent and extremely thin. Please post a link to the product page for your solar cell or describe the exact model/make. Nate, I ordered off of Ebay. It was a run-of-the-mill Solar Panel rated for 12V/.2A. I believe the most common application is for solar powering little fountain pumps in a garden. It was approx. $20. Sorry I cannot find the exact part. For me I wanted to be able to access it via the web from anywhere. You could do that same thing with 2 arduinos and having a PC/Web Server reading the serial data (or even the Arduino could stream the data in web format to the PC). I just didn’t want to leave a PC on all the time as a web server. 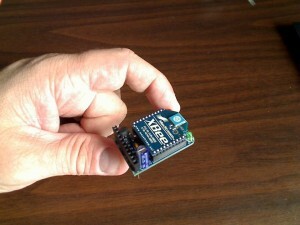 The ioBridge will publish all its data to the web all the time and onto my dashboard. I am sure there are Arduino-only ways to solve this as well. Let me know if you implement one! If you want to monitor the temperature at night, what added features would you need? Well, you’d have to have a battery or very large capacitor and be charging through the day, then it would be drawn from at night. Or, perhaps a standard battery that you would only draw from at night and replace every once in a while. I want to use the same temp probe with my Arduino. Can you just power the temp probe and hook it directly to the Arduino board? Does the temp probe constantly put out voltage on the analog line that corresponds to the temp? Also why do you scale the temp value by 6.875? Thanks, sorry for all the questions! Cool project by the way! Yeah, just hook it up to the arduino analog input and ground. It outputs a voltage, as you describe, in a range 0-255. You need to convert that output via a scaling factor (the 6.875) to get C or F. Mine was F. Its not really perfectly linear, usually, but it was close enough for me. Good luck dude! Two last questions, sorry for the bother. What voltage does the temp probe use? 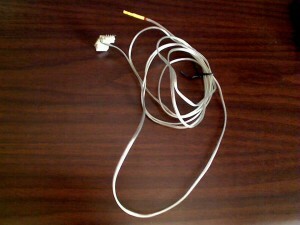 Also did you ever experiment with cable length on the temp probe? In some cases I may need to run 100 ft of communication cable between my Arduino and temp probe!